The topic of Evil spirit attachment or POSSESSION is not very popular, and SCARY also. Not popular because no one wants to speak about it, due to lack of knowledge and expertise in this domain. But when some one makes a movie on this subject, it becomes a block buster. All of us think that, whatever is shown in the movies is what really happens to individuals who are POSSESSED. Though in extreme cases it is possible, but most of the times it doesn’t happen that way. What is an Evil Spirit? How an Individual gets attached to evil spirits? How do we know if the individual is POSSESSED. 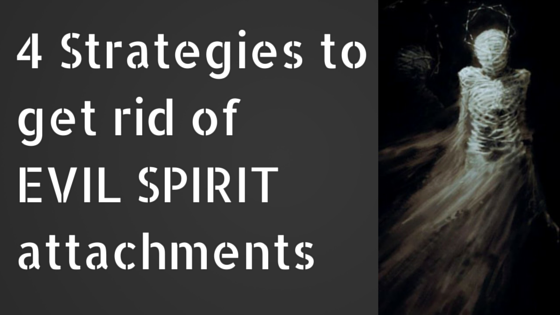 There are number of ways you can get rid of these evil spirits. But personally I find the following 5 ways to be safe and EFFECTIVE. Please follow the steps exactly as described below. What would you do, If an uninvited guest walks in to your house and wants to stay ? Yes, that’s exactly what you will do, to the evil spirit!! Ask it to leave. Is that so simple !! Yes it is. Why? Because most of the spirits were once human beings themselves. While it may seem silly, acting as their guide and counselling can put the spirit at ease and allows them to move on to the next level. Take a bucket full of water, expose it to sunlight for half-day or four hours minimum. After the seven days, the evil spirit has no choice but to leave because the evil spirit cannot stay, where energy is purified. You can do this step otherwise also, your energy body will thank you. Because SALT has the capacity to break down energy blocks and sunlight charges the water with SOLAR PRANA. Surround the shape or form and your solar plexus or stomach area again with white light. Continue this for a week, three times a day. Often you will find that, you won’t be able to implement the above strategies. As the person possessed will have reached a difficult situation, Just like those hollywood movies. In such cases, the safest and easiest way is to call me on 09177397261 because you need an expert to handle such really EVIL spirits. As a spiritual healer, you will encounter many challenges and demands, whether you are just starting or experienced healer, Sometimes it is better to seek expert help saving you lot of TIME, MONEY and a LIFE. What do you think? Have you used any of these strategies? How have they helped you? What helpful tools can you share? I have been tormented for a year now by a spirit that I knew was negative and nasty by the way it makes me feel (unexplained pain and severe fatigue) and tried multiple ways to rid it on my own. Then without success had contacted and paid multiple people whom claim they removed it… no answers to whom what where when or why… just they removed it. Well, guess what? They didn’t. So I finally contacted a medium who told me the man’s name, era he lived, his age, and that he is indeed evil. He had abused, raped and killed his 21 year old daughter and was now attached to me. While this cleared everything up for me and I suddenly could explain everything I’ve been going through, he still will not leave. He’s not interested in crossing over. So, now what? I’ve tried cleansing with white sage, praying, crystals, removals… I moved out of my apartment and have ignored this spirit for months…. nothing works. I understand human spirits have free willing but what about mine??? Hi Megan, Did you try the above strategies? Can you also send me your photograph to my mail ID vkr@chakra-healing.in! Will check and let you know!! Thank you so much for an excellent website that is to the point. I have been possessed and managed to cast out the dark/evil spirits but they still try to control my power through other ways.. I know this sounds large but my mission is truly to fight evil spirits and I believe my main mission is to free my husband`s family from a (very strong) generational curse, but of course the dark forces started attacking me as soon as I said yes to marry him, this is 10 years ago and we are almst at the point of signing divorce papers now… I found out about two years ago what on earth all the madness, illness and insane things that we were subjected to was rooted in.. I believe my husband is the one in their family that can bewak the curse and I am sent to make him aware and wake him up and make him aware.. but he does not want to, he does not believe I am right, he refuses to see the signs and the incredible things that led us ot eachother.. My name is angelica (meands like an angel, angel means messenger, angelica herb is especially good for casting out evil and breaking curses I read on one page..) I have not given up but is about to give up on him… Is this something you can give me advice about. I belive the curse is stron – this is not one evil spirit playing, but an army… and they have had a solid hold on the family for a long time. I think the family must have made a pact with the devil at one point. I also need help with cleansing my daughter who has been affected in this..
Also- why is a picture important? I have been followed by…something…since I was 3. He told me at 4 I would not live past 28. I turned 29 thus year and he has been relentless. His name is “Mercy” and I have only seen his true face once. I can’t describe the horror of that asymmetric, rotten fiend. As a child he appeared as a light or spoke to be telepathically most of the time. Now he dresses like a plague doctor and in person is around 7ft tall. I find him crouching next to the bed when my husband and I are asleep. He was in the bathroom while I was bathing, just standing in his horrible mask. He gives me nightmares about holding my deceased father hostage in purgatory. Hes usually not visible but I can either hear him or feel his presence. Help!? Wtf is Mercy!?!? How do I get him to, after 26 years…go? In a weird way he and I are attached in a terrible bond. I have i friend of mine who is possed byva ghost who wants to kill him. He has gone to may pandits and tried many remedies but nothing works much. Spirit is even talking to others near him saying that it will kill him. I have been getting progressively sick for 14 years. I have had extensive medical history of no diagnosis for the chronic fatigue, nausea, dizziness, weakness and pain. I have been hospitalized twice n 2017 and my pcp has referred me to many specialists. I have had a psychic, which I have known for years, come to my house shortly after I moved to it. We started to have issues with weird happenings immediately. She told me that I had a female spirit and gave me her name. I asked her if she would tell her to leave. She told me that she wouldn’t do that. Just let her stay and let the spirit share our space. As the year went by, I started to get sick, then sicker. My niece has a friend who is a sensitive. Mi asked her if her friend would be willing to come to my house and help me. She called my niece two days after the conversation and told her that the female spirit had been visiting her and that she was very mean. She was actually afraid of her. She said I knew who she was and that I had something of hers in my house. She said she couldn’t help me past that because she was going to block the spirit communication. She said the lady was mean in life and worse in death. That she was attached to me. It took me two weeks searching my house to find the item in my house. I was a piece of pottery I bought from an art sale at a garage sale. I had it two years before I moved into this house with no activity. The thing that convinced me that the pottery was the item is that the name the first physic gave me years before was actually signed by the artist in the bottom of the pottery. It was more than a coincidence. After that the activity became stronger. I called the original physic and she had me get a brow pape bag and write on it to the spirit that is in my house. She had me fold it and put it in the bottom of my freezer chest. The activity immediate ceased but I continued to get sicker. I have since encountered two more physics that have told me that the could she the female attachment standing behind me. I was told that I was sick because she was feeding off my energy. I have been so sick I asked it she was going to kill me and I was told no. She needs me to feed off my energy. I know I need to get rid off the item but I will still have the attachment. I’m not sure if I should bury it or throw it in the water. My health is really going down hill. I was off medical leave for seven month last year and have not been able to return to work full time. My doctor thinks I could have chronic fatigue or multiple sclerosis. Im not sure what do to. All I know is I want my life back. I sent you a message through email. Well…I was depressed because of my breakup. Then one day at night I called a evil soul by prayers and sacrificing my blood. Now it’s not leavinge at all. I can see it and feel it very well. I tried telling it my family but this spirit threatened to kill everyone so I was quiet. Please help me it’s getting hard for me everyday. My daughter and are plagued with nightmares of my ex husband also her father he is now dead. He was a very mean sadastic person. We have done lots of clearing, but now we have a cat that we had when he was alive the only thing we have kept she has gotten to where she will not let us sleep she scratses and will keep my daughter awake. My daughter also has major problems thyroid headaches and stomach problems this showed up after he died. Any suggestions would be greatly appreciated. Hello dear I need help desperately!! I have tried everything!! My daughter shot herself 5 years ago and after that evil spirits showed up in my home. I have an attached one I believe. I can’t function to do everyday life. I’m disabled because of a back condition and can’t stand up straight at all. I get sick all the time. This thing is male and it’s spoke to me two times. It said it’s name is dan. It doesn’t want me to have anything to do with my husband at all. It’s causing terrible trouble in my marriage of 20 years. I’ve tried the sage house blessing mediums getting close to God everything but nothing works. I want my life back. Please email me. Namaste ji, just started with your website and found it very helpful, many thanks.